JMCS Glasgow is the Glasgow section of the Junior Mountaineering Club of Scotland. We have weekend trips all over Scotland (and the UK) every fortnight throughout the year, using a wide selection of private mountain and roadside huts. 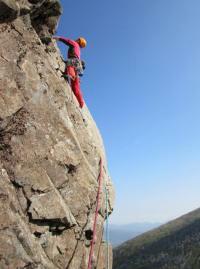 Our members take part in rock and winter climbing, as well as hill-walking, mountain biking, canoeing etc. Despite our name we have members of all ages from 18 to 85! During the summer we have regular evening climbing (or walking/running/biking) trips in and around the Glasgow area. In the winter these trips are replaced by an evenings at Glasgow Climbing Centre.